AVR is a 8 bit RISC Processor, which was originally developed by two students at the Norwegian Institute of Technology, named as Alf-Egil Bogen and Vegard Wollan. It is understood that the name AVR stands for Alf Vegard RISC. Now AVR is under the umbrella of Atmel Co. This tutorial describe use of AVR Studio, which is the IDE include GCC compiler for AVR. This article describe step by step use of AVR studio. ARM microprocessors have very large space in handheld market. Lot of products like mobile phone, compact software defines radios etc is using ARM processor. ARM now days has come up with Cortex architecture which give high performance at low power consumption. ARM processors are well supported by Linux. You can easily find linux board support package for ARM9 and onwards processors. For ARM7 processor uClinux can be easily ported. ARM development tools are also available in the market. GNU tools are also supporting ARM. Lot of development boards are also available in the market. 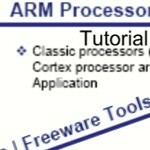 This presentation describes ARM processor basics and different tools available for ARM. Hope this will be useful for all. IAR workbench is very nice development tools for ARM. You can download their kickstart version from their website. Kickstart version is free to download and it comes with restriction of 32KB code size limit. Once you download then you can easily install it. This article describe project creating and debugging. This tutorial gives a brief comparison among different classic microprocessor families like 8085, 8086, 80186, Zilog 80 and Motorola 6800 processor. 8085 is considered as entry gate for learning of microcontrollers. In universities 8085, 8086 is the part of course. Hope that this will be useful for all.